That plan started pretty bad as yesterday I didn’t get any real hands in but did lose $468,60 in that small sample. My PokerTracker needed it’s HUD cache to be rebuild, I forgot to do that during the day and when I started my session my PC died on me twice. That obviously cost money, from both losing hands and time so I had 2 options: 1) play without a HUD 2) Wait for PokerTracker housekeeping to be done. I picked option #2 because it normally takes a little over 3 hours but after waiting for 5 hours I went to bed at 03:00 without playing any more hands. 45minutes later the housekeeping was done, grrr. Nobody else to blame but me and luckily I don’t have to work Wednesday so I can catch up, but I had preferred to consider that day as a bonus for this month. So what happened in April? I had a bet going for which I had to reach 80.000VPP. Not a huge amount for somebody who wants to reach SNE and actually not even enough to stay on pace but I had a lot of distractions in April as well. The first session of the month was good (+$613,50) but the following session were all pretty bad. On the 12th of the month I was down $3.500 which I’ve also blogged about in my previous blog. From there on I played 6 winning sessions in a row and almost hit the break even line a couple of times. I was very keen on getting break-even for the month. In the last session of the month I was up in the first bit and was really hoping to end the month strong. I didn’t get there and even lost $598,50 in that session finishing the month at -$1.377,50. I was swinging a lot between the -$1.000 and 0 for the last part of the month and to end the month below the -$1.000 was very disappointing. -$400 really don’t even sounds like a loss to me but $1.377,50 does. From the 4 months I’ve played so far, I’ve lost money in 3 of them, that’s not something I planned for. I did make it to 80.000VPPs so didn’t lose the bet but because Rock City King also got his 50.000VPPs I didn’t win any money. I think we both really profited from this bet anyway, so I’ll be happy to do it again! April had other difficulties. The amount of tables available isn’t the same as in Jan/Feb. When I start my play around 19:00/20:00 CEST there are not enough $3/$6 & $5/$10 tables to 20-table. I don’t need 24 tables, everything between 20-24 tables is enough, but 16 just doesn’t do it. Sometimes it gets better during the evening, but not always so fFor the 2nd part of the month I’ve been adding $2/$4 games to my games. I was a small loser for the month at $2/$4 (-$149) over a very small sample (6.957 hands), which doesn’t worry me as I’m confident I’m beating the $2/$4 games. The issue is more that it does give me some headaches as the game plays different. It was easier to play a mix between $3/$6 and $15/$30 then to add $2/$4 again. I’ve used to do this a lot last year and I will just have to adjust but due the the different sb/bb ratio and a lot more multiway pots it just requires some more attention. Comparing these stats to March there are some notable differences. I had to play 12 hours more to get the same 80.000 VPPs. This was because I played about 50 hands less an hour and together with the fact I had to play $2/$4 my VPPs/hour was lowered from 873 to 774. These things don’t look promising but no other way to counter them then just work more! The FPPs/Milestone total is on the low side because I didn’t hit a milestone this month. Since I will be reaching the 400.000 VPP milestone tonight, I have sort of a headstart in May. For May I don’t have a VPP goal. I would love to get 80.000 VPP again, but with the bad start and my girlfriend coming back I don’t expect to hit it. 60.000 should be a minimum leaving me at 450.000VPPs for the end of May. This is 50.000 VPPs below my target I had set myself at the beginning of the year. My new goal is to finish at 500.000VPPs at the end of June which would set me right on pace! Now that will be hard as well as I’m going to cycle Alpe D’Huez at the 6th of June. After doing that I will be going on a nice trip to Southern France. The plan is to visit San Remo, Monaco, Nice, Juan les Pins, Cannes & St Tropez! I’ll be back at the 14th of June, which is the day when the Netherlands is playing its first match of the World Cup Soccer! With all the holiday and soccer matches going on it will be hard to put in enough hands to get to 500.000 VPPs at the end of the month. It’s going to be a very tough two months but I’m confident I’ll still make it to SNE! I’m actually less confident if I’ll survive Alpe D’Huez 🙂 I haven’t trained this week so far as I was busy on Saturday and had to play a handball competition match on Sunday. A buddy of mine plays competition handball and they lacked a keeper for their match. I was a keeper for 5 years and joked that I would go. Before I knew it I had to actually play. Sure, I did do it for 5 years, but that was 14th years ago when I was still a kid. The idea was to train with the guys at Thursday and to play on Sunday but the training on Thursday was canceled. I ended up in the goal and I even stopped the first two penalties. We were able to keep up with the other team the first half, but the 2nd half they really beat us on stamina. Often it ended up them having 3 vs 1 players when throwing a quick offense and sure I’m not really good, but there isn’t a lot you can do as keeper against that sort of offensives. We lost 16-32! I did had fun though. Since today (like yesterday) it rains all day long I’m not playing to cycle and I doubt it’s getting any better tomorrow, Wednesday should be okay. I also got some troubles with my back, so I skip the gym tonight and hit the pokertables early! Getting back to the softplaying regs from my previous blog. Furbean has posted an update on his blog. It somewhat explains things, on the other side when you read the whole story (including PokerStars responses) you understand how bad it actually is. It might not have been a beneficial tactic for Furbean/Fua999 but it did create a lot of situations which would normally not have been there. I could explain a couple of these but if you are interested it might be better to read the whole thing yourself. The most weird part was the part where a phone call was made in specific situations when holding KK (Emails Part #4), I just don’t see that happening. First of all it’s actually hard to make a phone call when 20-24 tabling. Sure you can make it, but not in time without having issues with timebanks etc. 2nd, don’t we have things like skype/teamspeak/ventrillo? Or even MSN/AIM/ICQ/GoogleTalk? The whole phone call thing really sounds very weird to me and it put doubts in my mind if this is the full story. I liked Furbean as far as you can like a fellow online grinder but as mentioned in my previous blog, PokerStars did the only right thing. I did play some tournaments last Saturday as the quarterly $1.000.000 Supernova Freeroll was held again. With only 3322 players the value was pretty sweet but I was the first to leave the tournament! In the 5th hand I flopped bottom set on 358 board and got all the money in at the turn against 88. Maybe this wasn’t a very good play 200BB deep but I have issues with folding a set (especially as a limit player) if there are no flush/straights out there. I played some other $11-$22 tournaments which weren’t succesful and also participated in the PokerNews Freeroll where I did get to the Final table, finishing 4th for a booming $150! nice read again! nice months comming up! Nice 2 read Richard! Gogo! 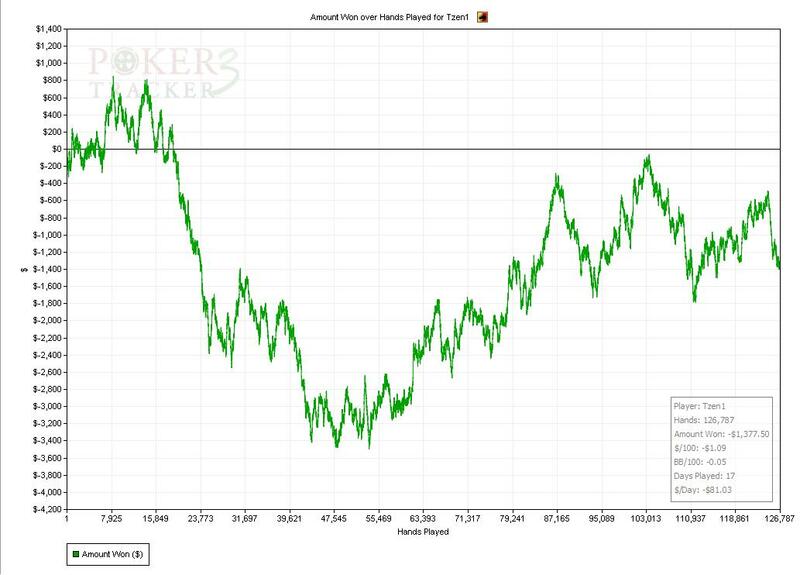 The money you have made so far (incl bonuses), are too few compared to your effort and poker knowledge. Do you believe it is variance, or that the games have become even harder to beat? All, thx for your replies!